Have you ever walked down a London street and wondered what the history of the area might be? How did the street get its name? What's that building over there? Who lived there? What was here before? Then this is the book you need. Paved with Gold covers eight central London neighborhoods and looks at each street carefully and with in-depth research. The author is David Long, who – and I always have to say this at the start of any book review of one of his titles – is someone I admire. David Long is an incredibly prolific author who has written many books about London (see more book reviews below). Long brings to life London's history with his detailed research and interesting anecdotes. As Paved with Gold is focused on the West End (central London), the eight areas featured are: Mayfair, St James's, Fitzrovia, Bloomsbury, Soho, Covent Garden and Strand, Westminster, and Belgravia. Each neighbourhood section starts with a map and a few pages describing it that often reminds us of the humble beginnings for these now wealthy areas. Published in late 2015, this large format hardback has 376 pages. The streets for each area are listed alphabetically and there's a comprehensive Index. Do note, Paved with Gold covers a high percentage of the streets in London's West End but not all. There are more than 200 black and white photographs throughout the book, plus a 16-page plate section in full color in the center. Every now and then there are pages dedicated to a theme such as "The London Club" explaining in more detail the subject of gentleman's clubs in London. Or "The Siege of Grosvenor Square" that features an historical event. I sat down and read this page by page whereas I expect most readers will use it as a reference book and look up the streets that interest them. It felt odd to read it in Chapters as the alphabetical ordering means streets are not listed in how you find them geographically. The book is large and heavy so it is best to keep at home and not one to take out with you while exploring. But I think this would be a fabulous companion to many happy hours at home using Google Street View to look around the West End. Long's research is always extensive and while reading it can feel as if you're walking the streets with a very knowledgeable friend. There are interesting tales of past residents: those still well-known and tales of remarkable people who are mostly now forgotten. And there are references to the blue plaques as that is often all we can now see of important lives at a location. The details include a house designed by William Kent that has been described as "the finest terraced house in London" and where you can see the oldest privately owned monument in London. Sometimes I felt features I enjoy along the streets were overlooked (such as the Bourdon Place statues) but mostly there was something new to discover on every page making this book great for Londoners and for those who have never visited. There's a wonderful description of a vast Georgian mansion in Mayfair, complete with carriage drive and gate lodges, that I have walked past but never stopped to admire. Plus famous births, deaths and crimes all over the place. I started to feel I had been walking around with blinkers on if I'd missed all of the goings on but, of course, it only comes to life when someone shares the information. And I just loved that there were references to when this really was "all fields". It was fascinating to read how often parts of buildings were saved and reused elsewhere or saved and displayed in a museum such as the V&A. The columns from Carlton House can now be seen in front of The National Gallery at Trafalgar Square, and the fireplaces were reused in Buckingham Palace and Windsor Castle. The black and white photographs are not always the most flattering images and I wished the photographer had spent longer on each shot so there wouldn't be people with carrier bags in the frame or vans driving past. But the words brought the location to life for me and the photos were simply accompaniments. 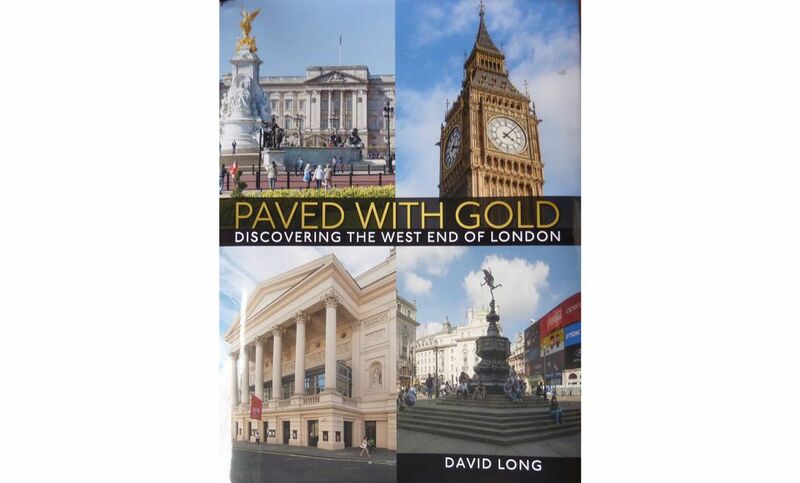 Paved with Gold is another really enjoyable book by David Long. Whether you think you know London well or are just starting out discovering the city's delights you will learn plenty from this book.